So, I tried. I tried, but I failed. I wanted to be a part of the ugly sandal crew (members exist, right?) but I couldn’t muster the necessary cool. The black Birkenstocks arrived this morning and were promptly returned this afternoon. 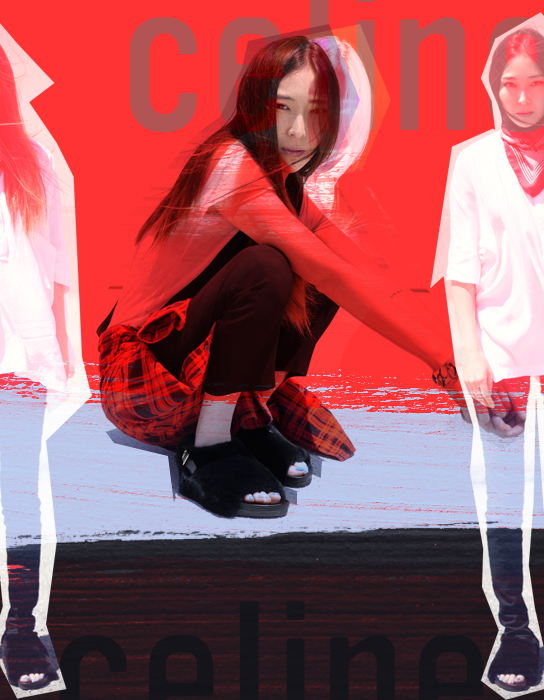 I was hoping to channel Céline. I instead channelled Céline Dion – Céline Dion on a particularly bad day, after a boozy night out and an argument with René, feet swollen like those of a hobbit. I do not have pretty feet. They are a size 8 but I still try to convince myself that they are a size 7. This is due to YEARS of having to squish my teenage feet into size 7s. Not for some shallow visual effect, just because shops then didn’t venture beyond a size 7, not for women anyway. Seeing a future ahead of retail purchases limited to Long Tall Sally, I wedged my feet into those size 7s for years, until some marketing genius noticed the genetic growth of the nation. By then, the damage was done – bulbous, creased squished toes, I paint such a pretty picture. I am aware of this reality thanks to the incessant, innate honesty of my 2-year-old son. He cannot help but regard my feet with utter disdain and often requests that I, “put them away…please.” My abhorrence of my own feet was exacerbated today by the arrival of the Birkenstocks. Husband commented, “You look like an 70’s R.E. teacher.” They sent the child into a nose-dive tantrum that lasted 20 minutes, interspersed by, “I DOWNT LIKE MUMMY’S TOES!” Just to put this incident into perspective, I have been airing the toes in sandals of various guises for many months now, encouraged by the heat wave. Not once have these other open-toed beauties caused such hysteria. So I therefore rescind my many Birkenstock pins on Pinterest and ask you kindly Doreen of Twitter, to stop sending me pictures of the various B-word sandals every 45 minutes or so. Original images (pre-manipulation) courtesy of Jayne Min of Stop It Right Now. She pulls off the awesomeness of Céline without a hint of Dion & I’m beyond envious. Living life through a filter is culturally embedded into our generation; every moment can be captured with your chosen subtly lit hue. However, the undeniable essence of cool, for most, still rests in black and white. If you search my blog archive, you’ll see I’ve extolled the virtues of Hedi Slimane’s Diary before. With ease and beauty, he photographs the most inane objects in an inky, minimal, black and white. Each photograph requires no label, no date, no description; it speaks for itself. His appointment at the then newly named, Saint Laurent, courted controversy and has continued to do so. Disparaging reviews of his last show, with off-the-hanger comparisons, called his reputation into question. But suddenly, as we bask in a heat wave and the autumn High Street collections emerge, Hedi Slimane’s Saint Laurent offers a predominant influence. The monochrome trend continues, this time favouring black. His wide-brim fedoras are coveted by all; a crisp white shirt offering the only contrast and his Nirvana grunge for the 21st century trumps all. So, I solely blame the artistic elegance of Slimane for my growing wishlist of black shoes, black skirts, black trousers and white shirts. I’ve suddenly become enamoured with ditsy printed tea dresses and bobbly (in a cool way) cardigans. 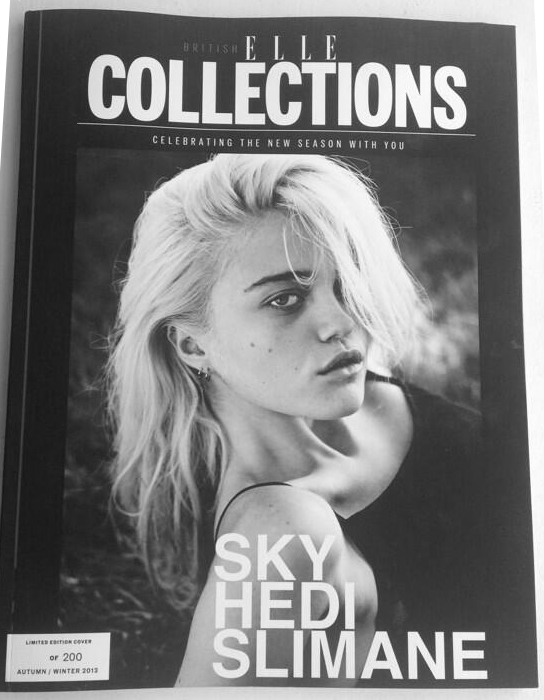 I’m also covetous of this new ELLE Collections limited edition – Sky Ferreira shot by Hedi Slimane. As a nation, as a generation, we are quick to criticise. I too, fell foul of this watching the live stream of the last Saint Laurent show but in Hedi’s de-saturated world of black and white, everything suddenly seems WAY cooler*. *I wanted to use the word RAD here to reflect the 90’s mood. I thought it would be less cringe worthy to asterisk it here. I was probably wrong. Photo credits – Sasha Pivovarova shot by Hedi Slimane, French Vogue (February 2008.) See the rest of that beautiful shoot here. ELLE Collections – pinched from Rebecca Lowthorpe’s Twitter.